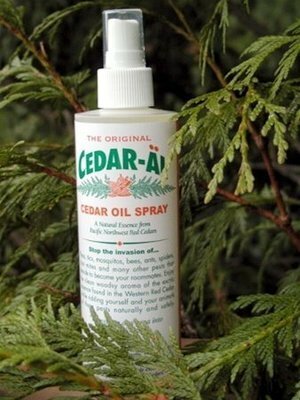 "We starting using the Cedar Oil Spray about a month ago and I really love this product. I use it all of the time now and it has been working great so far. The smell can be a little overwhelming just at the beginning, but it wears down quickly and then it smells amazing, so it's worth it. I have referred this product to a lot of people so far and will continue to do so. We have used it during camping trips and it works great. 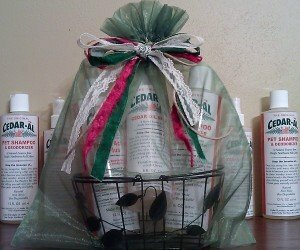 I absolutely love having an all-natural option as I hated using the chemical bug sprays. Thank you for providing such a great product!" 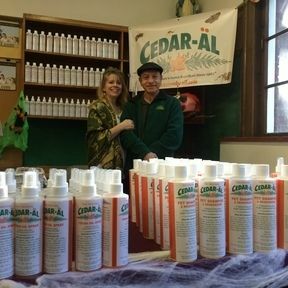 "I use CEDAR-AL at both my residence and office. 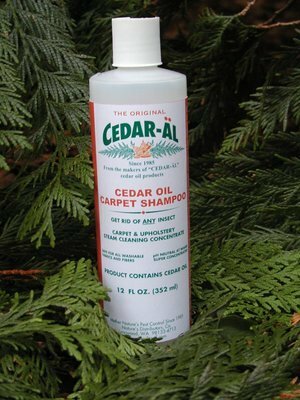 I like the smell of cedar and the CEDAR-AL does a very good job of eliminating odors, not just covering them up with a fragrance. I have two dogs who stay inside my house for several hours during the day. 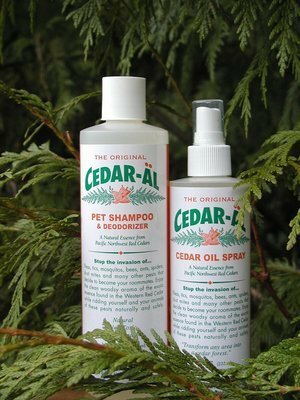 The CEDAR-AL gets rid of the "doggy" smell both on the dogs and their bedding." "I am a believer! This is the best summer we've had since we moved to "the woods" 5 years ago. Spiders, flies, moths, gnats, fruit flies, silver fish, mosquitoes, ticks, wasps, bees...GONE! We have three separate decks on our house. A light layer around doors, patio furniture and known problem areas and all signs of insect life disappear! I am positive it's due to this product because one of the decks that was not sprayed was fully infested. I've since taken care of that! One suggestion- dilute this product with a some water. A 50/50 mix still does the job! The smell is very pleasant but can be a little strong full strength. I've always had a spider problem in my bedroom. Now I keep the mix within reach. It kills spiders on contact...amazing! No more fly swatter or shoe, no more marked up walls, just a quick and painless end to the problem. I will NEVER use anything else! Thank you for your wonderful product, friendly service and fast shipping!" 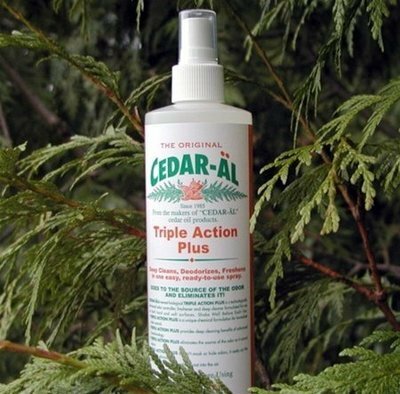 "Cedar oil works better than cancer-causing chemicals for ticks, and ticks can be really invasive to horses, they infest my horse under his chin, in his ears, under his shoulders, mane, tail, groin, all the tender spots, and this is the BEST product for chasing them away! Also, he LOVES when I spray him with it, he thinks it's his cologne and acts like he's getting some royal spa treatment. And I recently adopted a stray black lab so I now have 2 animals to use it on." "Let's be honest, before I used Cedar-Al doggie shampoo, I was pretty pugly. But now my Mama washes me every couple of weeks and I couldn't be happier! All of the bugs stay off and who can't resist a bug-free wrinkled-face pug?"" "This shampoo makes me smell like a forest and makes me super soft ! 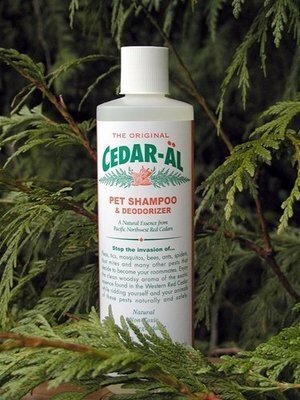 My dry skin is soothed and perfect now, I love CEDAR-AL Pet Shampoo ! !" 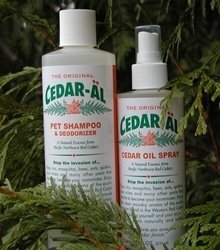 "Your shampoo made a HUGE difference with our one dog. He is a Great Pyrenees and absolutely STUNK no matter what kind of shampoo we used on him or how often we bathed him. We used your shampoo once on him over 2 weeks ago and he STILL smells good!!! Thank you for a great product!"